Our sweet mom, grandma, great-grandma, aunt and friend, Cleo Tebbs Marshall, 94, of Panguitch, Utah, passed away September 13, 2018 in Spanish Fork, Utah. She was born June 26, 1924 in Panguitch, to Mary Elizabeth Myers and Algernon Calvin Tebbs. She married Monte Marshall, April 28, 1944 in the Salt Lake Temple. He preceded her in death, January 2, 2009. She was a great leader of women. She was an active member of The Church of Jesus Christ of Latter-day Saints, serving faithfully in many callings, including Young Women’s president, Primary president, chorister, secretary, teacher and Stake Primary and Stake Relief Society president. She was involved in community clubs, serving as president of Questers, Homemakers, and twice president of Lady Lions. Cleo participated in the Garfield County 4-H program as a young girl and as an adult leader. While spending the winters in Phoenix, Arizona, Cleo was a third councilor in the Relief Society presidency assigned to over-see the snow bird sisters. She encouraged the quilting program and taught many how to make quilts. She also served as captain of the Daughters of Utah Pioneers three times in the Road Runners Camp. Education was very important to Cleo. She took classes when opportunity arose in everything from creative writing, upholstery, to music appreciation and art. She even took a computer class at age 73. She learned to oil paint and gave many beautiful paintings to her family. She and Monte encouraged their children to learn. All five children earned Bachelors, Masters degrees and beyond. Cleo loved poetry and wrote many beautiful poems for her family. She loved music. She loved to sing and encouraged music while raising her children. Our home was full of music coming from the piano, guitar, ukulele, stereo, radio, and high school band instruments. But best of all were the songs she sang to all of us. 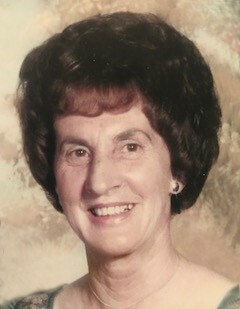 She is survived by her children: Steve and Marilyn Marshall, Panguitch; Dan and RoLana Marshall, Spanish Fork; Tom and Laraine Marshall, Cedar City; Mary Lou and Larry Newson, St. George; Marilyn and Barry Erickson, Glenwood; 34 grandchildren, 98 soon to be 100 great-grandchildren and 5 great-great-grandchildren, with 1 on the way. She was preceded in death by her husband; son-in-law, Craig Pearson; granddaughter, Shelly Marshall; and great-grandson, Cody Marshall.